These unique door hangers with Stick™ were developed to increase distribution options on today's entryways while keeping your door hanger securely attached to the door and off the lawn. This remarkable door hanger sticks to glass, metal and plastic and leaves no residue when removed. On the doorknob or the glass storm door at eye level, it outperforms traditional die cut door hangers and opens up valuable design space on the front of the door hanger. It is highly effective because the door hanger can be repositioned to an interior surface to keep your advertising in view. 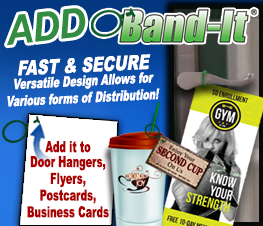 Add Band-It® to your door hanger for TWO DISTRIBUTION METHODS -- the ultimate door hanger solution! STICK BANNER WITH DISCLAIMER: We used to require our Stick disclaimer be added to every Stick product however our newly updated liner includes the Stick disclaimer printed right onto it so now you only add the Stick Banner if you want it. The banner image is available in the online design tool under Images and if you are ordering design services simply let the designer know in the instructions that you want the Stick banner included on your printed piece. When distributing door hanger Stick products you will want to fold the liner halfway back so that when the customer brings the door hanger inside the home, they can remove the rest of the liner and stick it to the fridge with a fresh piece of adhesive. Also the liner is still attached to the product when the customer gets it in case they have any questions or concerns as to what surfaces they can stick the door hanger to.